A good development workflow has the ability to make good developers great, whereas a bad development workflow will cripple developers and cost the project countless hours. Continuous integration makes it possible to start writing and running tests from the beginning. Although this is only a benefit for those who choose to write good tests, it enables developers to be aware of broken code just minutes after it's broken. Veterans of continuous integration workflows know that any one bug should only be found by a human once. Once a bug is found and reported, developers can write a test for that piece of functionality and, as long as tests are being run during continuous integration, that bug will never be able to surface again. Here at Insight, we use continuous integration on as many projects as possible. When we started doing AngularJS development, we looked for best practices integrating with Jenkins — our continuous integration tool of choice. Note: This article assumes a basic knowledge of Jenkins. Do all of this every time code changes in our private Git repository. Jenkins is responsible for watching for code changes while Grunt takes care of all of the preparation, such as minifying and running tests. Installations for npm can be found at the NodeJS website. To read more about Grunt and how to tailor it for your application, the official Grunt documentation is very useful. Now that the AngularJS project is all set up for continuous integration, it's time to set up Jenkins. After you create a new job and name it according to your project, the next step is to set up Jenkins to point to your project's source code management repository. Once that’s set up, scroll down to Build Triggers and check the box next to Poll SCM. We set the schedule to H/5 * * * * to check SCM five times an hour. The npm install command will install the dependencies we require in order to build the project. We use bower and, in order to install the required dependencies, we run bower install. Lastly, we created a custom Grunt process (which you can see in our sample Gruntfile) called cibuild that prepares our app for production. We now need to handle what happens after the build process finishes or aborts. 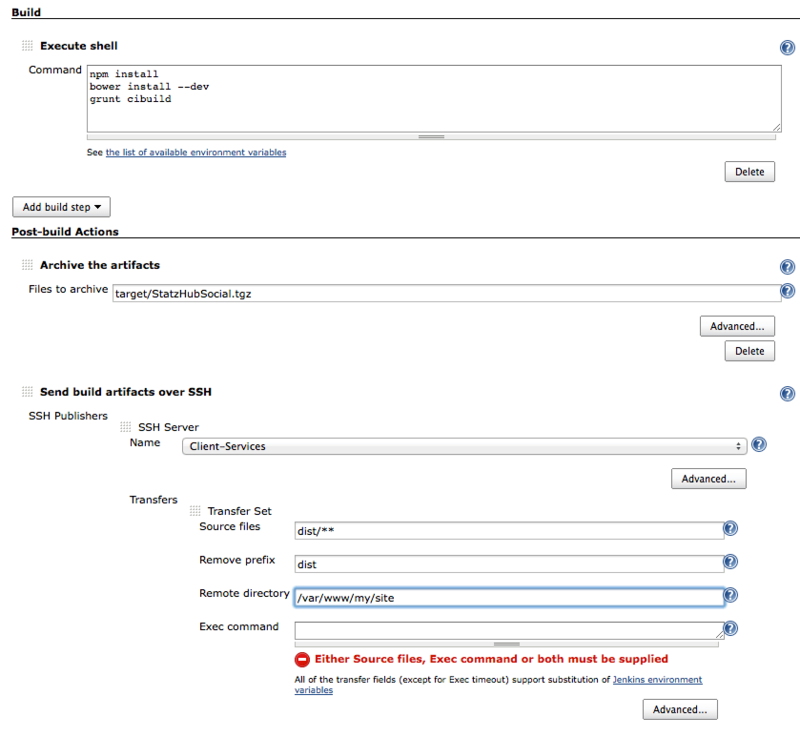 We added a post-build step to send an email if the build fails. We also specify the archived file we created during the build process. It’s important to specify that you want to Publish JUnit test result report with the XML file that was generated by the Grunt command. This is what Jenkins will use to determine if the tests passed or failed. Lastly, we use Secure Shell to transfer the archived file to our dev environment and unzip the file so it’s available to the public. This way, our clients can see what we’re building as we’re building it. With all of these steps in place, you and your team will be set up for success. Whenever you push new code, Jenkins will run the tests and push the latest code to your servers so you can show off all of the hard work you put into your AngularJS application. Additionally, should any tests fail, the application will not be pushed out, and you’ll be promptly notified. From here on, you can continue to add to your Gruntfile as you find plug-ins that decrease redundancies and increase productivity. This article originally appeared on July 2, 2014.